What rule does the dealer follow regarding hitting or not in blackjack? Blackjack is one of the few table games that actually uses quite a bit of strategy, which is why it has drawn some controversy for card counting (this is a totally different blog post topic). Today, we will answer another of our reader questions. 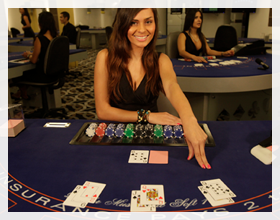 The rule depends on the dealer’s hand and the casino where the game is played. Each casino will have its own set of dealer rules, but most of the time the rules are basically the same. If the dealer’s hand equals 16 or less, he has to keep hitting until he gets a 17, a 21, or busts. Most dealers will stand on a soft 17, and all dealers will stand on a “hard” 17, which is a safer bet for the house. Before you begin play, you should always inquire as to the Blackjack dealer’s rules for the casino you’re in. If you’re playing online Blackjack, you are probably playing a game in which the general rules apply. Palace of Chance is a one of a kind online table gaming experience and our gaming technology closely follows the rules you’d find in Vegas casino. Come by, sit down at one of our tables, and enjoy the game play, whether you win or lose.